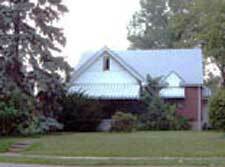 Selling Two Adjacent Properties in the Quiet and Convenient Neighborhood of Silverton. Enter this two-bedroom brick home through a large front porch into a nice living room with brick fireplace and tile hearth. The dining room is nice sized and has a ceiling fan. The large eat-in kitchen includes pantry, ceiling fan, and a GE side-by-side refrigerator/freezer. The hallway, with coat closet, leads to a tiled bath with shower and a large linen closet. Down the hall are two large bedrooms with closets. Top-grade, random-width oak flooring covers the living room, dining room and hallway. Standard-width hardwood flooring covers both bedrooms. The extra large deluxe attic is well lit and could be converted into additional bedrooms and/or family room. Off the kitchen is a side entrance and stairs to the lower level. The full basement includes washer and dryer hookups (for either electric or gas dryer), laundry tubs, and an updated Bryant furnace with electric air filter and humidifier. The home includes central air, one-car garage, and a large paved parking area. This well constructed home needs some updating. The spectacular lot for this property is over a half acre, private and level, with walnut shade trees. 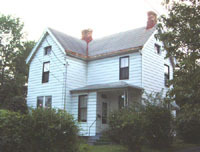 The two-story, three-bedroom, older frame house is in need of repair. The first floor comprises a living room, dining room, and large kitchen. The basement includes laundry tubs, 220 hookups, and an older furnace. Upstairs you will find a hall closet, three bedrooms, and a full bath. 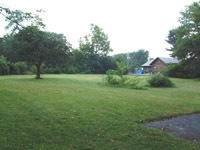 The property also includes a paved driveway and a small outbuilding. This is an ideal building site affording lots of options. 33k miles, like-new tires, clean inside and out, air, luggage rack, fold-down 3rd seat, tilt steering, stereo cassette, power windows, locks, mirrors and seats. This classic, large wagon has a great look and would make an ideal family vehicle. Bidding information: The Auction of this Real Estate will be conducted in much the same manner as an auction of personal property. The auctioneer will move at a slower pace so that every interested bidder clearly understands exactly the amount of the previous bid and the amount he is asking for. Bidders will have the opportunity to bid as many times as they choose. See Terms and Conditions for more. The car sells before the real estate. The brick home will be offered first. At the conclusion of the bidding, the high bid will be held. Then the white home will be offered. At the conclusion of the bidding, the high bid will be held. The auctioneer will then offer both properties combined. A bid of $1,000 above the sum of the two held bids will be necessary to open the bidding. If this bid is made, additional bids on the combined properties will be taken until a high bidder is declared and the combined properties are sold. If there is no interest in the properties together, the two held bids will be considered final.